Enable your employees to help your customers. Most customers like to be helped, if you are truly interested in creating value for them. We believe that the best people, are the ones that focuses on creating value for their customers. We call these people Value Creators. Our focus is to help your Value Creators perform. Imagine your Value Creators have access to all the relevant files for a given customer or opportunity directly in your CRM system. No going to another solution. No manual linking. No time waisted searching for presentations, brochures, templates, contracts, pricelists, proposals, etc. SalesValue solves this automatically, and is the invisible bridge between your file shares and your CRM system. Selling to and collaborating with potential customers is getting ever more complex, as more people get involved in the process. CEB/Gartner estimates the number of people involved in a typical B2B solutions purchases is 6.8. 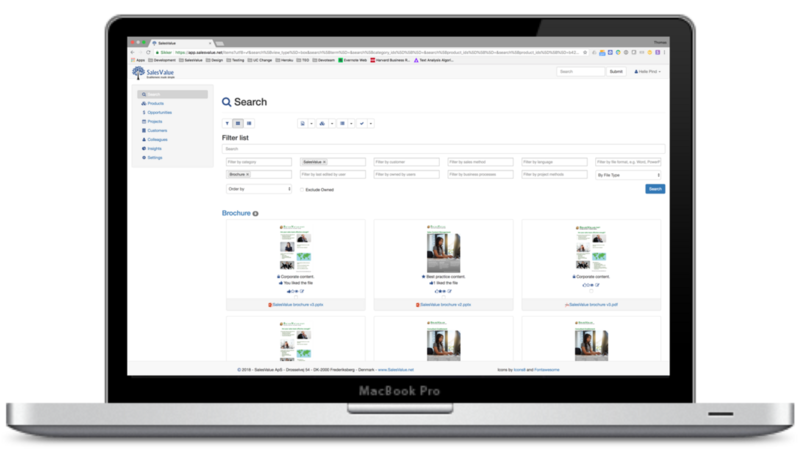 SalesValue uses the power of machine learning to give you intelligent search and filtering. You can quickly find the right material based on product, opportunity, file type, customer, etc. Research shows that sales people often don't use the content produced by marketing. Sales people often create their own material like presentations, proposals, solution descriptions, etc. The material created by the sales team is often not shared. This means that critical knowledge is lost. 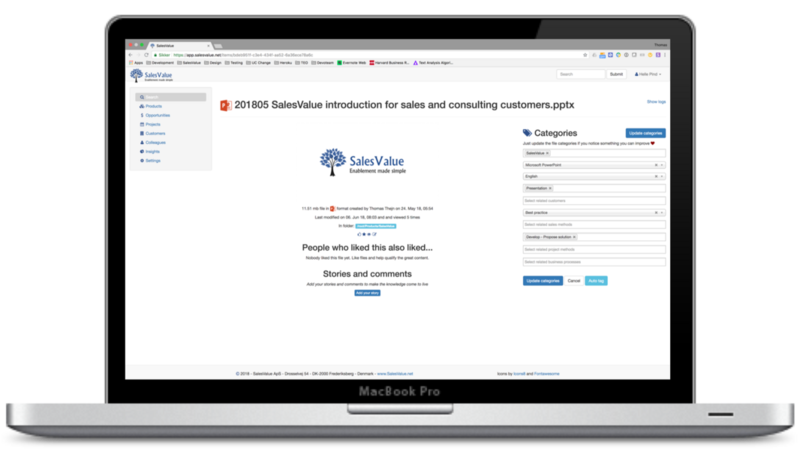 SalesValue allows your employees to connect their file shares, and share the knowledge stored in here. This can easily include a lot of unstructured content, but SalesValue helps you make order in the content and present it in right context. And the employees have full controll over what they share. SalesValue works as a plugin to your CRM system, and increases the value of your investment. Your sales reps get the most relevant content presented directly in the CRM. SalesValue is integrated into the relevant forms like Opportunities and Accounts, and uses the context to find the most relevant content and training material. SalesValue automatically collects knowledge from your whole team and automates the knowledge sharing through machine learning and algorithms. In SalesValue you can collaborate and improve the knowledge by adding relevant tags to files, making them easier for others to find. You can also like files and add your experience and recommendations through comments. It all helps to make the solution smarter for everybody. The search is your single pane of glass to all the documents in the system. Through free text search or intelligent filtering, on file format, file type, customer, product, author, opportunity, etc., you can find the content that you need. On the product pages your sales team find information about How to sell your products and Tools to sell the products. 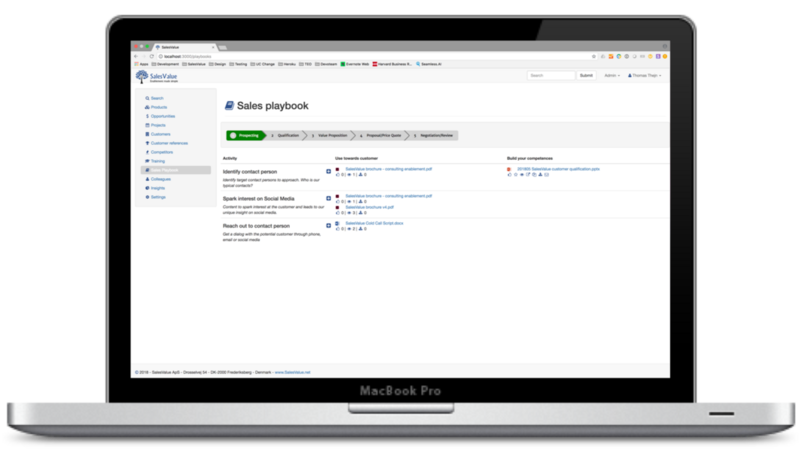 When you build a sales playbook in SalesValue it helps you increase win rates and reduce onboarding time. 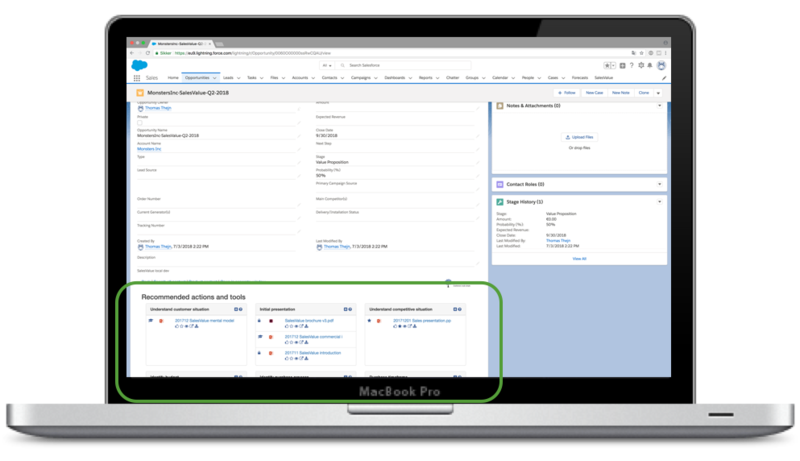 The sales playbook allows you to define which content is most relevant in for each activity in your customers buying journey and your sales process, for each product. 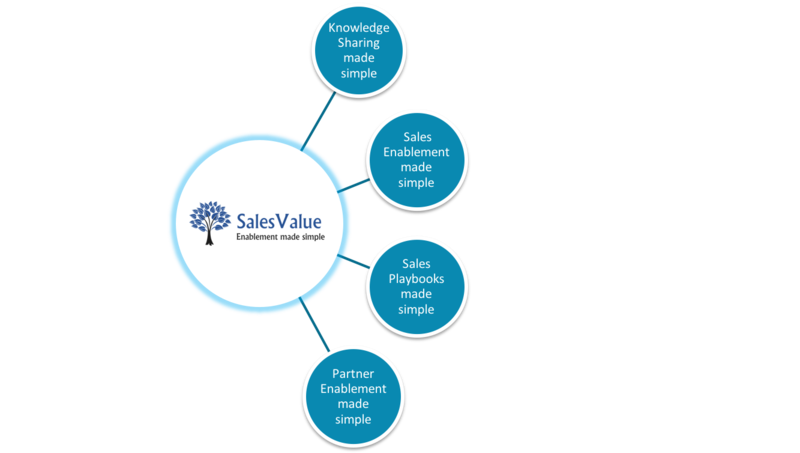 SalesValue then presents the most relevant content to the sales person directly in their CRM system on their opportunities. On the Opportunity pages you find recommendations for relevant content to use for your opportunities based on the opportunity products and the customer, as well as the opportunity stage and sales activities. 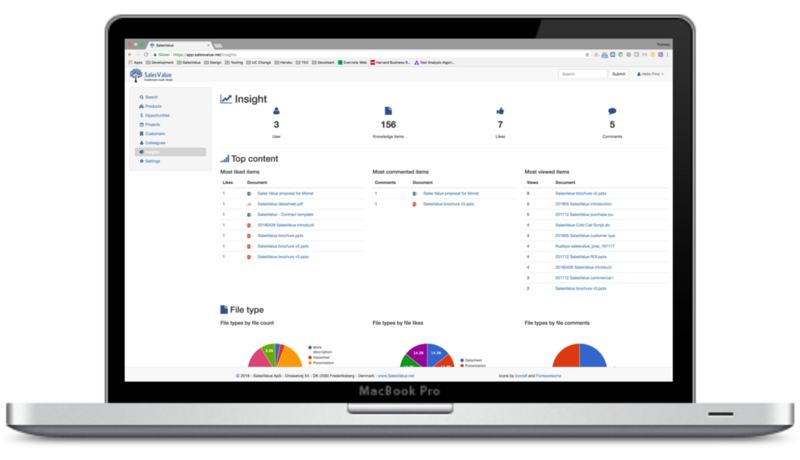 SalesValue provides you insights into your content. What get's used and what is highest rated. 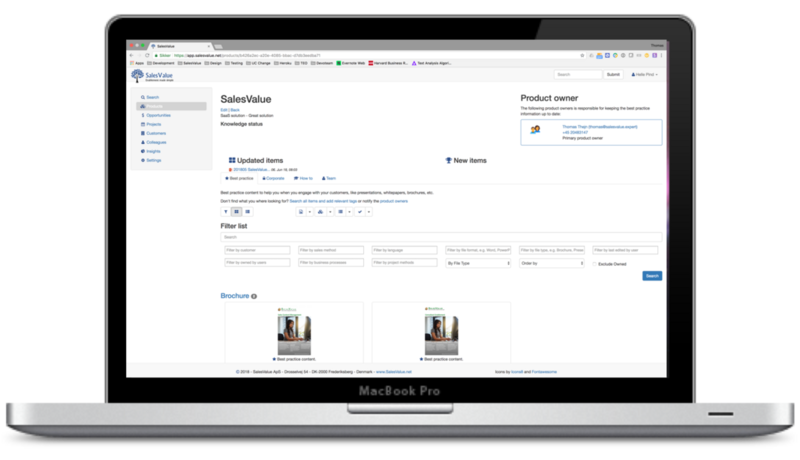 SalesValue is a Software as a Service solution hosted in a secure cloud allowing you to get started within minutes. SalesValue imports meta data about your organisations files from your file repositories, like Microsoft SharePoint, Microsoft OneDrive and Google Drive, as well as context from your CRM system, like customers, opportunities and products. File type, e.g. presentation, contract, whitepaper, etc. SalesValue have the following integrations. Business to Business sales is interactions where long term relations matters and customer purchase process is often complex involving several different people. This means that you have a very skilled sales team. 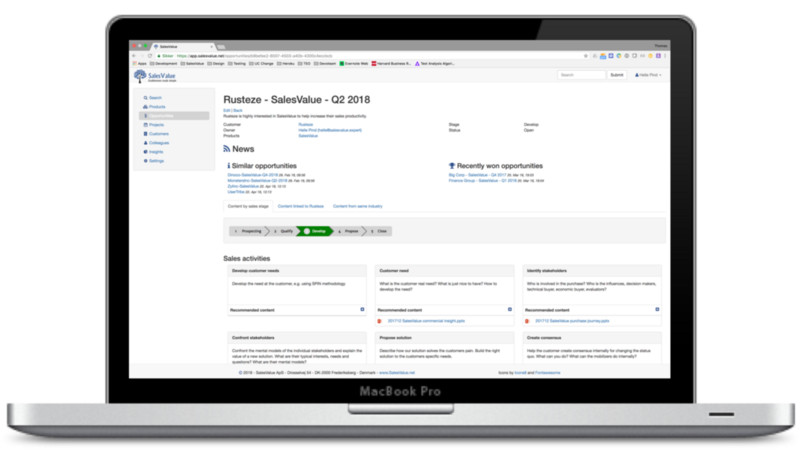 SalesValue is designed to help your sales team get their job done smarter. Your product or solution is not a commodity and involves a long evaluation process for the customer, that is often different for each sale and each customer. This requires understanding the customer business, requirements and needs, and adapting the sales process to help the customer navigate their own evaluation and decision process. SalesValue helps your sales team quickly find what they need in the ever growing content, and produce better content by collaborating and sharing in the sales team. We focus on helping small and medium sized sales teams. SalesValue is easy to use and delivers fast results, with minimal efforts, which typical fits the requirements of SMB organisations. We focus on requiring a minimum of configuration, as well as daily maintenance and administration by your sales team, marketing and product owners. SalesValue do this through our smart integration to your files storage and your system CRM, combined with our machine learning. Unlike some of the larger sales enablement vendors have great and very advanced solutions, but requires a lot of configuration, customization and effort to maintain.